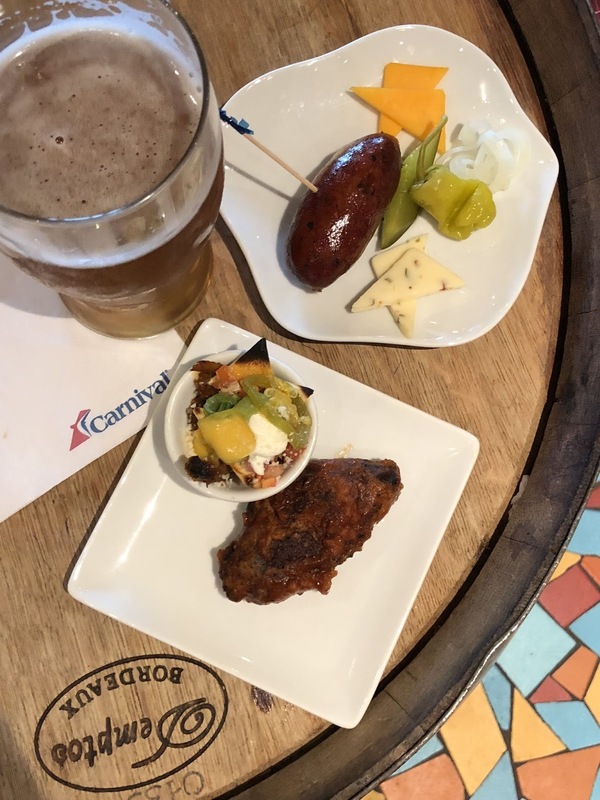 On Sunday my husband and I boarded the Carnival Vista for a few hours to check out four new beers that will debut exclusively on the brand new Carnival Horizon in April 2018. These beers were created by Caranival's Master Brewmaster Colin Presby (who has the coolest job of anyone I've ever met) and will be featured at a new concept restaurant, Guy’s Pig & Anchor Bar-B-Que Smokehouse|Brewhouse by Food Network Star Guy Fieri. 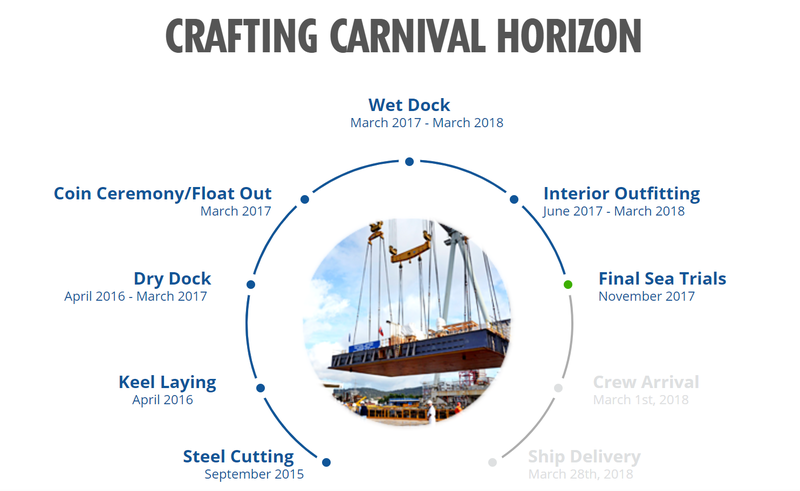 The Carnival Horizon is Carnival Vista's sister ship and it will set sail in Europe on April 2, 2018. Ironically, I found myself back onboard the Vista exactly a year after I sailed her with my best friend Keri for our annual girls cruise. I was excited to show Gabe the Vista and it seemed like just yesterday that I was a passenger myself....I seriously did not want to get off that ship on Sunday. 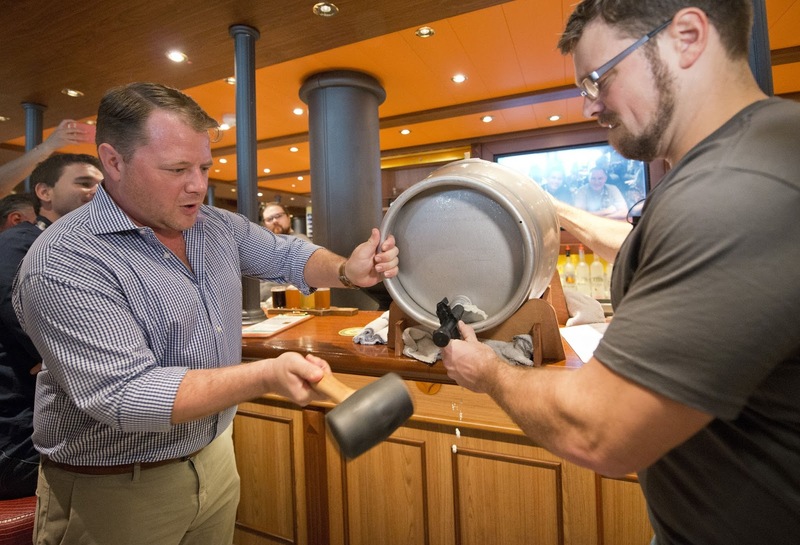 After a quick tour of the Vista, we headed over to Red Frog Pub where the beers would be unveiled in a traditional keg-tapping. When I sailed the Vista last year, the Red Frog Pub quickly became one of my favorite watering holes on the ship. 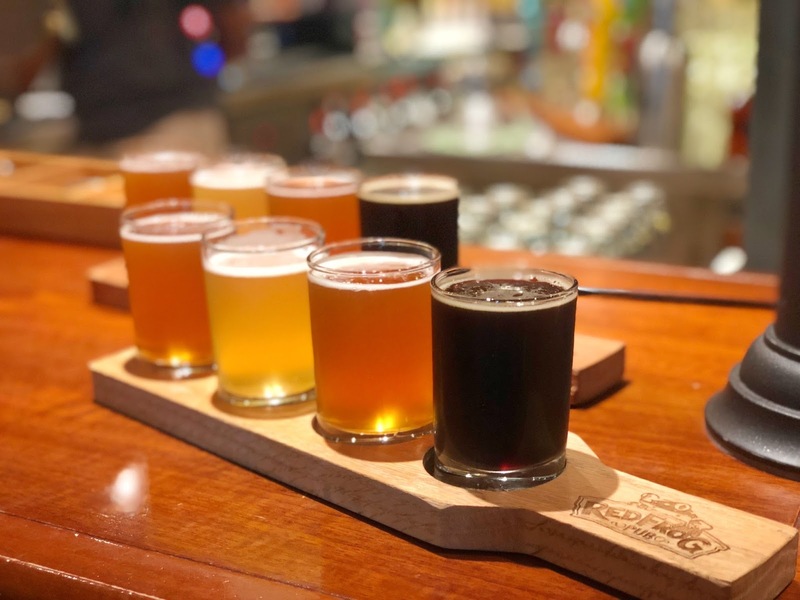 Aside from being home to the first brewery at sea, this popular pub features popular pub games, table kegs and you can even go on a brewery tour. I laughed knowing if Gabe and I were to ever sail on the Vista, this would be where you would find him at all times. Time for the beer! First a little about how and why the beers were developed. Colin Presby created these new four beers exclusively for Carnival Horizon’s Guy’s Pig & Anchor Bar-B-Que Smokehouse|Brewhouse. This will be a new dining concept that combines the best of both worlds – an onboard brewery and a full-service restaurant featuring BBQ favorites and sides developed by Food Network star Guy Fieri, who is a member of the American Royal National Barbecue Hall of Fame. The brewery takes center stage at Smokehouse|Brewhouse, which, in addition to delicious craft beers and custom cocktails, will offer a rustic, down-home décor as well as a variety of Fieri-designed favorites, all smoked “low and slow” using the chef’s signature rubs and spices. The offerings include smoked-on-board brisket, Memphis-style back ribs, dry-rubbed chicken, pulled pork, and cedar-smoked salmon, along with the chef’s own take on traditional sides and his signature sauces. Dinner menu items are offered on an a la carte basis with a free-of-charge self-service BBQ lunch buffet available on embarkation day and sea days. A host of other dining venues aboard Carnival Horizon are also available, including the line’s first teppanyaki restaurant Bonsai Teppanyaki, Cucina del Capitano family-style Italian restaurant, Fahrenheit 555 steakhouse, the Mexican-themed BlueIguana Cantina eatery, the 24-hour Pizzeria del Capitano, and the New England-inspired Seafood Shack. 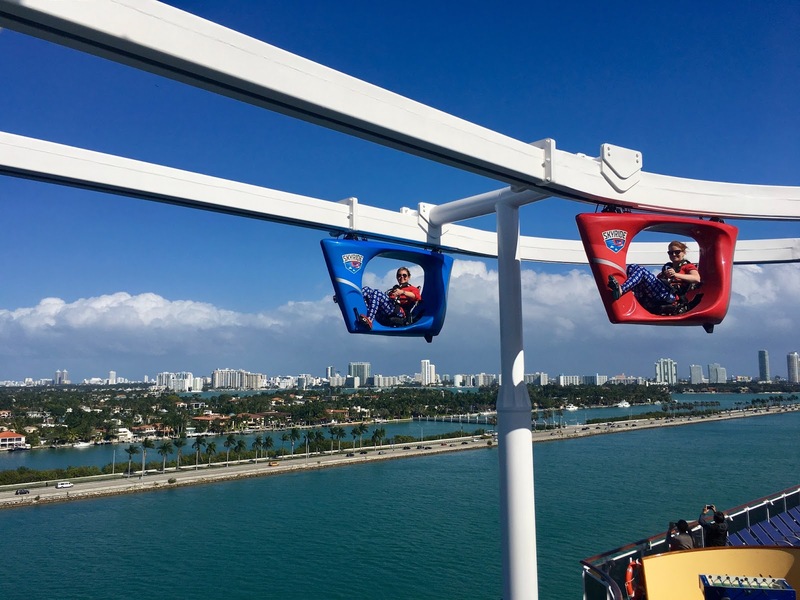 Other features include the groundbreaking bike-ride-in-the-sky attraction called SkyRide, an IMAX Theatre, and the first Dr. Seuss-themed water park at sea. A wide range of accommodations – from spa cabins with exclusive privileges at the luxurious Cloud 9 Spa, extra-roomy staterooms in Family Harbor to tropics-inspired Havana staterooms and suites with exclusive daytime access to a Cuban-themed bar and pool – will also be offered. Following its summer schedule of four-day Bermuda and eight-day Caribbean departures from the Big Apple, Carnival Horizon will shift to Miami and kick off a year-round schedule of six- and eight-day Caribbean cruises beginning Sept. 22, 2018 (which happens to be sailing during our wedding anniversary....hmmmm). Carnival Horizon will also offer a special two-day cruise to Nassau from Miami Sept. 20-22, 2018. Click here to view the Carnival Horizon sailings. I personally cannot wait for the Horizon to set sail and check her out personally! Thanks to Carnival for hosting my husband and I in Miami. As always, all opinions are my own.